Received July 31, 2018; Revised August 18, 2018; Accepted October 16, 2018. This study was conducted to identify DNA markers related to resistance to herbicide containing mesotrione in Tongil type rice. Two Tongil type elite lines; Milyang154 and Suweon382, showed resistance to mesotrione, whereas the others were susceptible at 20 days after mesotrione application, and severe growth inhibition was observed in the remaining 13 lines. As a result of analysis of mesotrione resistance using 190 F2 populations derived from a cross of Hanareum2 (susceptible) and Milyang154 (resistant), the mesotrione resistance locus was shown to be a single dominant gene with a 3:1 segregation ratio (X2=1.19, P=0.31). To identify a DNA marker closely linked to the mesotrione resistance gene, bulked segregant analysis (BSA) was adopted. The DNA marker RM3501 was identified on chromosome 2 with a recombinant value of 0.53 to the mesotrione resistance gene. Mst1(t) was located between SSR (simple sequence repeat) markers RM3501 and RM324 with a physical map distance of 10.2 Mb–11.4 Mb on chromosome 2. The band pattern of agarose gel electrophoresis of the SSR marker RM3501 showed the same segregation pattern with respect to mesotrione treatment in 20 Tongil type varieties and a BC2F2 segregation population derived from a cross between Unkwang (resistant) and Hanareum2 (susceptible). Thus, the RM3501 DNA marker could be used in breeding programs for Marker Assisted Selection in mesotrione resistant rice breeding. 작물 재배에서 잡초의 방제는 필수적이며 특히 벼 재배에서 수량감수에 가장 큰 요인은 잡초이다(Lee & Pyon 2002). Mesotrione은 옥수수에서 문제가 되는 일년생 광엽잡초를 방제하기 위해 개발된 Benzoylcyclohexane-1,3-dione계 제초제로서 Californian bottlebrush에서 얻어진 천연독소에서 유래하였으며, Tyrosine을 Plastoquinone과 α-tocopherol로 전환시키는 HPPD (4-hydroxyphenyl pyruvate dioxygenase)효소의 경쟁적 억제제로 작용하여(Mitchell et al. 2001) 식물 잎에 백화현상을 일으키고 심한 경우 잎을 괴사시킨다(Barta & Boger 1996, Pallett et al. 1997, Garcia et al. 1999, Lee et al. 1997, McCurdy et al. 2009). Mesotrione은 미국, 유럽, 라틴아메리카에서 옥수수와 수수 재배 시 발아 전,후 처리 제초제로 널리 사용되고 있으며(O’Sullivan et al. 2002, Abit & Al-Khatib 2009), 우리나라의 경우 벼 재배 시 surlfonylurea계 제초제에 저항성인 물달개비, 알방동사니, 마디꽃 등을 방제하기 위해 이앙 후 5~7일에 잡초 출아 전 처리제로 사용되고 있다(Kim et al. 2010). Mesotrione과 작용 기작이 유사한 bezobicyclon의 표준량 처리 시 통일형과 일부 특수미 품종에서 백화현상 또는 고사되는 약해가 발생하였으나, 자포니카 벼 품종은 약해가 없거나 적었다(Im et al. 2007, Im et al. 2008, Han et al. 2009, Yang et al. 2010). MP (Mesotrione + Pretilachlor)와 BMPP (Bensulfuron-methyl_Mestrione + Pretilachlor + Pyriftalid) 에 대한 벼 생태형간 약해반응실험에 따르면, 표준량 90 g a.i./ha에서 통일형 벼 품종의 초장억제율은 18~43%, 2배량 처리구에서 30~50%이었다. 건물중 억제율은 표준량에서 46~73%, 배량에서 65~82%로 초장보다 억제율이 높았다. 반면, 자포니카 벼 품종은 초장과 건물중의 처리 간 차이가 없었다. 벼 생태형별 MP에 대한 50% 생육억제 농도를 조사한 결과, 통일형 벼는 37 g a.i./ha로 자포니카 벼의 476 g a.i./ha보다 12.9배나 낮았다(Kim et al. 2010). DNA marker는 두 개 또는 그 이상의 개체에 의해 전달되는 유전적 정보에 대한 차이를 쉽게 구별시켜 준다(Bostein et al. 1980, Paterson et al. 1991). DNA marker를 이용한 기술은 관행 육종방법으로 해결하기 힘든 여러 문제들에 대한 해법을 제시해 주는데, Marker Assisted Selection (MAS)을 적용하기 위해서는 목표 형질과 밀접히 연관된 marker 개발이 필요하며, 이를 위해서 유전분석 집단 육성, 유전자지도 작성 및 정확한 생물 검정이 선행되어야 한다(Jena et al. 2003). 또한, DNA marker를 이용한 선발은 비용을 절감하고 초기세대에 고정된 저항성 개체 선발, 여교잡 육종의 효율 증진과 유전자 집적 계통 선발이 가능하다는 장점 때문에 작물의 질적 및 양적형질 개량에 많이 활용되고 있다(Peleman & Voort 2003, Yencho et al. 2000). 국내외적으로 DNA marker를 이용한 육종이 활발히 진행되고 있다. 벼 흰잎마름병 저항성 유전자 Xa1 등 연관된 DNA marker를 이용하여 흰잎마름병 저항성 품종이 육성되었고(Chu et al. 2006, Gu et al. 2005, Song et al. 1995, Yoshimura et al. 1998), 도열병 저항성 유전자 Piz 등을 도입한 저항성 품종 육성에도 연관 marker가 사용되었다(Hayashi et al. 2006). Hayano et al. (2000)은 벼 줄무늬 잎마름병에 관련된 저항성 유전자(Stvb-i)에 관련된 STS 마커를 개발하였다. 한편, 작물에 제초제 저항성을 도입하기위한 육종은 주로 형질전환이나 돌연변이체를 이용하여 수행되었다. 특히 콩, 옥수수, 목화, 카놀라, 알팔파, 사탕무 등에서 Glyphosate와 같은 비선택성 제초제 저항성 형질전환체가 육성되었다. 벼에서는 감마선을 조사하여 aryloxyphenoxypropionate에 저항성인 돌연변이 계통 육성(Andrade et al. 2018)과 HPPD 억제제 저항성 돌연변이 육성 방법이 개발되었다(Bernacchi et al. 2018). 제초제는 잡초 이외에 주작물에 피해를 주어서는 안되는데, mesotrione은 통일형과 일부 특수미 품종에 약해를 발생시키고 있다. 따라서 본 연구는 msotrione함유 제초제에 대한 통일형 벼 품종의 약해반응을 분석하여 저항성 품종을 탐색하고, 이를 토대로 저항성과 감수성 집단을 육성하여 mesotrione함유 제초제 저항성 유전자와 관련된 DNA 연관 marker를 탐색하기 위해 수행하였다. Mesotrione 처리에 대한 통일형 벼 품종의 반응 확인을 위해 다산 등 15개 품종을 공시하였다(Table 1). 각 품종은 볍씨 발아기(KW-450)에서 30°C로 48시간 종자소독 및 침종한 후 산파용 모판에 파종한 후 30일 동안 육묘한 후 재식거리 20 cm × 20 cm로 품종당 1본씩 10개체씩 포장에 이앙하였다. 이앙 후 5일째 대조구를 제외하고 mesotrione을 표준량(90 g a.i.ha-1) 및 2배량(180 g a.i.ha-1)을 처리한 후 시험구별로 약제 처리 후 5일에 달관조사 하였으며, 백화현상이 나타난 것을 감수성, 정상으로 생육한 것을 저항성으로 구분하였다. 생육억제율은 약제 처리 20일 후 식물체를 채취하여 초장 및 건물중을 조사하여 무처리구와 대비하였고, 생육억제율은 다음과 같은 식으로 계산하였다. Fifteen Tongil type varieties in experiment. 통계 분석은 컴퓨터 통계 프로그램인 SAS (ver. 9.1)를 이용하여 Duncan’s 다중검정을 실시하였다. Mesotrione에 감수성인 한아름2호와 저항성인 밀양154호를 각각 모본과 부본으로 인공교배를 실시하여 YR29136의 교배번호를 부여하고, 양성된 F2 종자 200개를 72공 육묘상자에 파종하여 30일 동안 육묘 후 mesotrione을 표준량(90 g a.i. ha-1) 처리하였다. 처리 후 5일에 달관조사로 개체별 백화현상 발생여부에 따라 저항성과 감수성을 구분하였다. 저항성과 연관된 DNA marker 탐색은 842개의 SSR marker를 이용하여 Bulked Segregant analysis (BSA) 방법에 따라 수행하였다(Michelmore et al. 1991). YR29136 (한아름2호/밀양154호) F2 집단에서 생육이 건전하고 약해 증상이 전혀 없는 저항성 20개체와, 백화현상이 명확히 나타난 감수성 20개체를 선발하여, 저항성 bulk와 감수성 bulk로 각각 혼합하였다. BSA는 모본, 부본, 저항성 bulk 및 감수성 bulk의 4개 DNA를 이용하였으며 marker는 벼 염색체 1번~12번에 존재하는 SSR marker를 이용하였다. 육성된 YR29136 (한아름2호/밀양154호) F2 190개체에 대해 PCR과 전기영동을 수행하여 각 개체별로 유전자형을 조사하였다. Genomic DNA는 CTAB 방법으로(Murray & Thompson 1980) 추출하였다. PCR반응 조건은 McCouch et al. (2002)의 조건에 따라 denaturation을 95°C에서 30초, annealing을 55°C에서 30초, polymerization을 72°C에서 1분으로 40 cycle 실시하였다. PCR 반응을 끝낸 증폭 산물은 3% agarose gel에서 120V로 1시간 30분 동안 전기영동을 수행하여, EtBr로 염색한 다음 UV transilluminator에서 촬영하여 유전자형을 조사하였다. 다산 등 15개의 통일형 초다수성 벼 품종을 공시하여 mesotrione을 표준량(90 g a.i. ha-1) 처리한 결과, 처리 후 5일째 품종간 백화현상에 차이가 나타났으며, 밀양154호와 수원382호는 약해 증상 없이 정상적인 생육을 하였다. 반면 다산 등 13개 통일형 품종은 약해가 발생하였으며, 심한 개체는 위조현상이 나타났다(Fig. 1, Table 2). Kim et al. (2010) 따르면, 통일형 벼는 처리 후 5일부터 신엽에서 백화현상이 나타나기 시작하여 7일에 가장 뚜렷하다고 하였다. 이는 mesotrione이 광엽성 잡초에 백화현상을 일으켜 광합성을 저해하여 고사하게 하는 반응과 일치하였다(Barta & Boger 1996, Pallett et al. 1997, Garcia et al. 1999, Lee et al. 1997, McCurdy et al. 2009). Reaction to mesotrione on Tong-Il type rice varieties at 5 days after treatment. Milyang154 (resistant) and showed resistant phenotype, while Hanareum2 and Hanareum (susceptible) showed bleach in newly emerged leaves. Reaction to mesotrione at fifteen Tong-Il type rice varieties. Mesotrione을 처리하고 20일 경과 후, 가야 등 15개 통일형 벼 품종의 초장 및 건물중 억제정도는 Tables 3, 4와 같다. 가야 등 13개 품종의 초장의 생육은 무처리에 대비해 표준량(90 a.i. ha-1)에서 12.2~37.6%, 2배량(180 a.i. ha-1)에서 19.4~58.9% 억제되었다. 반면, 밀양154호와 수원382호는 무처리에 대비해 표준량에서 무처리 대비 각각 7.4%, 6.7%, 2배량에서 각각 11.9%, 10.2%로 억제율이 낮았다. 건물중의 경우 가야 등 13개 감수성 품종은 무처리에 대비해 표준량에서 15.8~93.4%, 2배량에서 67.7~98.8% 억제되었으나, 밀양154호와 수원382호는 무처리에 대비해 표준량에서 각각 13.7%, 3.1%, 2배량에서 31.3%, 26.9%로 감수성 품종들보다 억제율이 매우 낮았다. 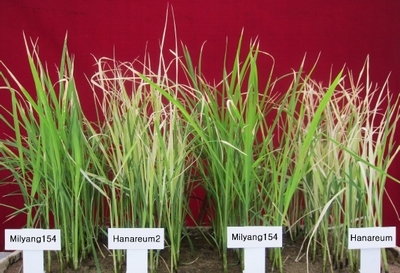 Plant height inhibition of Tongil type rice varieties at 20 days after treatment of mesotrione. Means with the same letters in a row did not significantly differ at 5% DMRT (Duncan’s Multiple Range Test). Dry weight inhibition of Tongil type rice varieties at 20 days after treatment of mesotrione. Means with the same letters in a row did not significantly differ at 5% DMRT. 한아름2호/밀양154호의 F2 190개체에 대한 mesotrione 생물검정을 수행한 결과 저항성이 149개체, 감수성이 41개체로 이론적 분리비 3:1(X2=1.19, P=0.31)에 적합한 것으로 분석되었다. 따라서, mesotrione 저항성 유전자는 1개의 우성유전자에 지배되는 것으로 나타났다(Table 5). 한편, mesotrione 저항성 관련 유전자는 현재까지 보고된 바가 없어 Mst1(t)로 명명하였다. Segregation of reactions to Hanareum2/Milyang154 in F2 populations after application of mesotrione. Michelmore et al. (1991)이 BSA법으로 YR29136의 F2 집단 중 mesotrione에 저항성과 감수성을 나타낸 개체의 각 bulk DNA와 한아름2호 및 밀양154호의 DNA를 이용하여 1번 염색체부터 12번 염색체까지 실험을 실시하였다. 그 결과 RM1358과 RM3501은 저항성 bulk에서 heterozygous한 유전자형을 나타냈고, 감수성 bulk에서는 homozygous한 한아름2호의 유전자형을 가지고 있다. 반면, RM3515와 RM7511은 저항성 bulk와 감수성 bulk 모두 heterozygous한 유전자형을 나타내어 저항성유전자와 연관이 낮은 것으로 나타났다. 이 결과를 토대로 mesotrione 저항성 관련 유전자의 후보 연관 DNA marker로 2번 염색체 단완에 존재하는 RM1358과 RM3501를 선발하였다(Fig. 2). Polymorphism of four SSR markers in BSA derived from F2 population of Hanareum2/Milyang154. Each set of four lanes results from PCR amplification with four SSR Markers: RM1358, RM3501, RM3515, and RM7511. In each set, the first and second lanes contain parental DNA from Hanareum2 and Milyang154. In RM1358 and RM3501, the third lane contains bulked DNA from heterozygous-resistant individuals; the fourth lane contains bulked DNA from homozygous-susceptible individuals. P1; Hanareum2, P2; Milyang154, RB; Resistant bulk DNA, SB; Susceptible bulk DNA. BSA 분석에서 찾은 mesotrione 저항성과 연관된 SSR marker RM1358과 RM3501은 2번 염색체 10.2 Mb 인근에 위치해 있었다. 이들 marker 주변에 위치하는 RM12921 등 4개의 SSR marker를 추가하여 한아름2호/밀양154호 F2 190개체에 대해 mesotrione 저항성 연관분석을 실시하였다(Table 6). RM1358과 RM3501의 조환가는 각 0.53%로 가장 낮아 이 두 marker가 mesotrione 저항성 관련 유전자와 연관이 높았다. 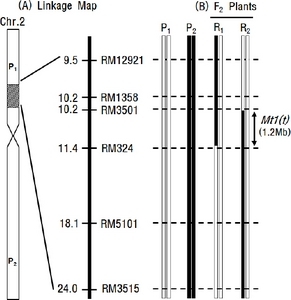 Linkage analysis of mesotrione resistance gene (Mst1(t)) and SSR markers on chromosome2 in the F2 190 plant derived from a cross between Hanareum2 and Milyang154. A/a represents SSR marker genotype. AA: homozygous for Milyang154 allele, Aa: heterozygous, aa: homozygous for Hanareum2 allele. B/b represents phenotype for Mst1(t), BB or Bb: resistant to mesotrione, bb: susceptible to mesotrione. Fine mapping을 위해 YR29136 F2 집단의 저항성 개체 중 RM12921에서 재조환이 일어난 F2-2 등 3개체와 RM5101에서 재조환이 일어난 F2-76 등 2개체를 선발하여 유전자형을 분석하였다. F2-137은 RM12921부터 RM3501까지 재조환이 일어났고, F2-76은 RM324부터 RM5101까지 재조환이 일어났다. 따라서, mesotrione 저항성 관련 유전자는 RM3501과 RM324 사이인 10.2 Mb~11.4 Mb에 존하는 것으로 추정된다(Fig. 3). Table 6에서 RM3501과 RM324의 조환률이 각각 0.53%과 2.65%이므로, RM3501을 mesotrione 저항성 MAS용 분자 marker로 선발하였다. Chromosomal location of Mt1(t) gene. Linkage map of Mt1(t) gene (A). Graphical genotype of F2 plants resistant to mesotrione (B). A block box indicates the introgression region by a donor parent. P1; Hanareum2, P2; Milyang154, R1; F2-189, R2; F2-137. Mesotrione 저항성 선발용 marker로써 RM3501의 활용성을 검토하고자 다산 등 20개 통일형 품종의 유전자형을 분석하였다. 다산 등 18개의 감수성 품종은 모두 한아름2호와 동일한 유전자형을 가지고 있었으며, 저항성 계통인 밀양154호와 수원382호는 감수성 품종들과 다른 유전자형을 나타내었다(Fig. 4). 따라서, RM3501은 agarose gel상에서 통일형 벼 품종 육성의 mesotrione 저항성 선발 DNA marker로써 활용이 가능한 것으로 판단되었다. Polymorphism of RM3501 in Tongil type varieties. 1:Milyang154, 2:Suweon382, 3:Hanareum2, 4:Dasan1, 5:Dasan, 6:Hanareum, 7:Keunseom, 8:Milyang23, 9:Namyeong, 10:Saegyejinmi, 11:Yongju, 12:Yongmun, 13:Milyang258, 14:Milyang259, 15:Suweon543, 16:Gaya, 17:Anda, 18:Jangseong, 19:Taebaeg, 20:Hangangchal1. Mesotrione에 저항성인 운광을 1회친으로 하고, 감수성인 한아름2호를 반복친으로 하여 2회 여교잡한 BC2F2 집단에 생물검정을 통한 백화현상의 유무로 저항성과 감수성을 구분하고, 각각의 DNA를 추출 후 RM3501을 이용하여 전기영동을 실시한 결과는 Table 7과 같다. 생물검정을 통한 저항성 개체와 감수성개체에 대한 유전자형을 비교 한 결과 모두 일치하였다. 저항성 개체는 저항성 공여친인 운광의 유전자형을 갖는 homozygous형 또는 heterozygous형을 나타낸 반면, 감수성 개체의 유전자형은 감수성 공여친인 한아름의 homozygous형을 보였다(Fig. 5). 따라서 RM3501은 통일형과 자포니카 품종간 교배에서도 mesotrione 저항성 선발 marker로써 사용이 가능한 것으로 판단되었다. Linkage analysis of DNA marker RM3501 and mesotrione resistant gene in BC2F2 population. PCR amplification of BC2F2 population derived from a cross between Unkwang (U) and Hanareum (H) with RM3501 as a R or S marker-associated with the Mst1(t) gene. Resistant progenies are homozygous for the Unkwang (U) allele and heterozygous. Susceptible progenies are homozygous for the Hanareum (H). 분자육종의 실용적인 marker는 목표형질과 밀접히 연관되어 있거나 완전 연관되어 있어야 하고, 육종가가 사용하기 편리해야 하며, 실험한 집단에 한해서 특이적인 것보다는 동일한 목적의 다른 집단에서도 적용이 가능한 marker가 바람직하다(Lee 2005). 본 실험결과, 다산 등 대부분의 통일형 벼 품종은 mesotrione에 감수성이며, 밀양154호와 수원382호는 저항성을 나타내었다. Mesotrione 저항성 관련 유전자는 1개의 우성유전자에 의해 지배되며, 2번 염색체 단완의 10.2 Mb~11.4 Mb에 존재하였다. 현재까지 가장 근접한 연관 marker는 RM3501로서 통일형 벼 품종의 저항성 육종에서 mesotrione 저항성 선발 marker로 활용이 가능하며, 자포니카와 인디카의 원연교잡에도 적용이 가능한 것으로 확인되었다. 한편, Mitchell et al. (2001)에 따르면 mesotrione은 tyrosine을 plastoquinone과 α-tocopherol로 전환시키는 HPPD (4-hydroxyphenyl pyruvate dioxygenase)효소의 경쟁적 억제제로 작용한다고 하였다. 벼에서 HPPD 유전자는 Os02g0168100으로서 2번 염색체 단완의 약 3.7 Mb에 위치하고 있다(http://rapdb.dna.affrc.go.jp). 그러나, 본 실험에서 탐색한 mesotrione 저항성 유전자는 10.2~11.4 Mb에 존재하여 HPPD유전자와 거리가 약 6.5~7.7 Mb 떨어져 있다. 따라서, mesotrione저항성 관련 유전자와 HPPD 유전자는 관련이 없는 것으로 판단된다. Mitchell et al. (2001)은 옥수수의 경우 mesotrione의 흡수 속도가 잡초보다 늦어서 저항성을 보인다고 하였다. 통일형 벼 품종 중 저항성을 보였던, 밀양154호와 수원382호도 mesotrione의 흡수 속도가 감수성 품종보다 느려서 저항성을 나타낸 것일 수도 있으며, HPPD의 활성이 감수성보다 더 높거나, 그 효소의 구조가 달라서 억제기작이 일어나지 않을 수도 있을 것이다. 또한 HPPD가 결핍되어도 그 다음 단계의 기작이 크게 영향을 받지 않는 경우도 고려해 볼 수 있다. 그러나 현재까지 실험적으로 증명이 된 것이 없으므로 향후 이에 대한 추가 적인 연구가 진행되어야 할 것으로 생각된다. 다산 등 15개의 통일형 벼 품종을 이용하여 mesotrione을 처리한 후 5일부터 다산 등 13개 품종들은 신엽에서 백화현상이 발생하였으나, 밀양154호와 수원382호는 백화현상이 발생하지 않아 저항성 품종으로 선발되었다. Mesotrione 처리 후 다산 등 13개 품종들의 초장 및 건물중 억제율은 밀양154호와 수원382호보다 더 높았으며 약량에 따른 억제율이 증가하였다. 한아름2호/밀양154호의 F2 집단을 이용한 유전분석 결과 저항성이 149개체, 감수성이 41개체로 이론적 분리비 3:1(X2=1.19, P=0.31)에 적합하여, mesotrione 저항성 관련 유전자는 1개의 우성유전자에 지배되는 것으로 나타났다. BSA방법을 이용하여 mesotrione저항성 관련 유전자를 탐색한 결과, 2번 염색체의 10.2 Mb에 위치한 SSR marker RM1358과 RM3501을 선발하였다. Fine mapping을 위해 선발된 5개의 저항성 개체 중에서 F2-137은 RM12921부터 RM3501까지 재조환이 일어났고, F2-76은 RM324부터 RM5101까지 재조환이 일어났다. 따라서, mesotrione 저항성 관련 유전자는 RM3501과 RM324 사이인 10.2 Mb~11.4 Mb에 존재하며, RM3501과 RM324의 조환률이 각각 0.53%과 2.65%이므로, RM3501을 mesotrione저항성 유전자 DNA 연관 marker로 선발하였다. 다산 등 20개 통일형 품종 및 mesotrione에 저항성을 나타내는 자포니카 품종인 운광과 감수성인 통일형 한아름의 BC2F2 집단을 이용하여 RM3501의 MAS 이용 가능성을 검토한 결과, mesotrione 저항성 선발 marker로 활용은 가능하나, 정확한 선발 maker로 활용하기 위해서는 추가적인 실험이 필요할 것으로 판단된다. 본 논문은 농촌진흥청 연구사업(과제번호: PJ010267012018)의 지원으로 이루어진 것임. Abit MJM, and Al-Khatib K. Absorption, translocation and metabolism of mesotrione in grain sorghum. Weed Sci 2009;57:563-566. Andrade A, Tulmann-Neto A, Tcacenco FA, Marschalek R, Pereira A, de Oliveira Neto A, Scheuermann KK, Wickert E, and Noldin JA. Development of rice (Oryza sativa) lines resistant to aryloxyphenoxypropionate herbicides through induced mutation with gamma rays. Plant Breed 2018;137:364-369. Barta IC, and Boger P. Purification and characterization of 4-hydroxyphenylpyruvate dioxygenase from maize. Pestic Sci 1996;48:109-116. Bernacchi D, Knepper C, Rasmussen RD, Cuevas F, Channarayappa VR, Hinga M, and Moon MS. Methods and composition for combinations of mutations associated with herbicide resistance/tolerance in rice. US Patent 669,086, filed Aug. 4, 2017, and issued Mar. 8, 2018 2018. Chu Z, Yuan M, Yao J, Ge X, Yuan B, Xu C, Li X, Fu B, Li Z, Bennetzen ZL, Zhang Q, and Wang S. Promoter mutation of an essential gene for pollen development results in disease resistance in rice. Genes Dev 2006;20:1250-1255. Garcia I, Rodgers M, Pepin R, Hsich TF, and Matringe M. Characterization and subcellular compartmentation of recombinant 4-hydroxyphenylpyruvate dioxygenase from Arabidopsis in transgenic tobacco. Plant Physiol 1999;119:1507-1516. Gu K, Yang B, Tian D, Wu L, Wang D, Sreekala C, Yang F, Chu Z, Wang G, White FF, and Yin Z. R gene expression induced by a type-II effector triggers disease resistance in rice. Nature 2005;435:1122-1125. Han SS, Yoo KY, Park MS, and Kang DW. Reactivity of herbicide benzobicyclon in rice and weed rice. Kor J Weed Sci 2009;29:105. Hayano-Saito Y, Saito K, Nakamura S, Kawasaki S, and Iwasaki M. Fine physical mapping of a rice stripe resistance gene, Stvb-i. Theor Appl Genet 2000;101:56-63. Hayashi K, Yoshida H, and Ashikawa I. Development of PCR–based allele-specific and InDel marker sets for nine rice blast resistance genes. Theor Appl Genet 2006;113:251-260. Im IB, Kim S, and Ahn SH. Damage response of benzobicyclon for rice varieties. Kor J Weed Sci 2007;27:46. Im IB, Kim S, Ahn SH, An XH, and Cho SH. Control characteristics of weed (Red) rice (Oryza sativa L.) by benzobicyclon application. Kor J Weed Sci 2008;28:181-188. Jena KK, Moon HP, and Mackill DJ. Marker assisted selection - A new paradigm in plant breeding. Korean J Breed Sci 2003;35:133-140. Kim SY, Lee JY, Yeo US, Oh SH, Park ST, Lee JH, Jeong KH, Cho JH, Song YC, and Kang HW. Differential tolerance of rice cultivars to mesotrione-contained herbicides. Kor J Weed Sci 2010;30:300-307. Lee SG, and Pyon JY. Emergence and early growth of perennial paddy weeds as affected by temperature conditions. Kor J Weed Sci 2002;22:334-341. Lee DL, Prisbylla MP, Cromatie TH, Dagarin DP, Howard SW, Provan WM, Ellis MK, Fraser T, and LC Mutter. The discovery of p-hydroxyphenylpyruvate dioxygenase. Weed Sci 1997;45:601-609. McCouch SR, Teytelman L, Xu Y, Lobos KB, Clare K, Walton M, Fu BY, Maghirang R, Li Z, Xing Y, Zhang Q, Kono I, Yano M, Fjellstom R, Declerck G, Scheider D, Cartinhour S, Ware D, and Stein L. Development and mapping of 2240 new SSR markers for rice (Oryza sativaL.). DNA Research 2002;9:199-207. McCurdy JD, McElroy JS, Kopsell DA, and Sams CE. Mesotrione control and pigment concentration of large carabgrass (Digitaria sanguinalis) under varying environmental conditions. Pest Manag Sci 2009;65:640-644. Michelmore RW, Paran I, and Kesseli RV. A rapid method to detect markers in specific genomic regions by using segregating populations. Proc Natl Acad Sci USA 1991;88:9828-9832. Mitchell G, Bartlett DW, Fraser TE, Hawkes TR, Holtz DC, Townson JK, and Wichert RA. Mesotrione: a new selective herbicide for use in maize. Pest Manage Sci 2001;57:120-28. Murray MG, and Thompson WF. Rapid isolation of high molecular-weight plant DNA. Nucleic Acids Res 1980;8:4321-4325. O&apos;Sullivan J, Zandstra J, and Sikkema P. Sweet corn (Zea mays) cultivar sensitivity to mesotrione. Weed Technol 2002;16:421-425. Pallett KE, Little JP, Veerasekaran P, and Viviani F. Inhibition of 4-hydroxyphenylpyruvate dioxygenase: the mode of action of the herbicide RPA 201772 (Isoxaflutole). Pestic Sci 1997;50:83-84. Paterson AH, Damon S, Zamir JD, Rabinowhitch HD, Lincoln SE, Lander ES, and Tanksley SD. Mendelian factors underlying quantitative traits in tomato: Comparison across species, generations, and environments. Genetics 1991;127:181-197. Peleman JD, and van der Voort JR. Breeding by design. Trends Plant Sci 2003;8:330-334. Song SY, Wang GL, Chen LL, Kim HS, Pi LY, Holsten T, Gardner J, Wang B, Zhai WX, Zhu LH, Fauquet C, and Ronald PC. A receptor kinase-like protein encoded by the rice disease resistance gene, Xa21. Science 1995;270:1804-1806. Yang WH, Shon JY, Kim JH, Jung HY, Ahn EK, Kim BK, Park TS, and Yoon YH. Phytotoxicity of whole crop forage rice to benzobicyclon. Kor J Weed Sci 2010;32:225-231. Yencho GC, Cohen MB, and Byrne PF. Applications of tagging and mapping insect resistant loci in plants. Annu Rev Entomol 2000;45:393-422. Yoshimura S, Yamanouchi U, Katayose Y, Toki S, Wang Z, Kono I, Kurata N, Yano M, Iwata N, and Sasaki T. Expression of Xa1, a bacterial blight resistance gene in rice, is induced by bacterial inoculation. Proc Natl Acad Sci USA 1998;95:1663-1668.